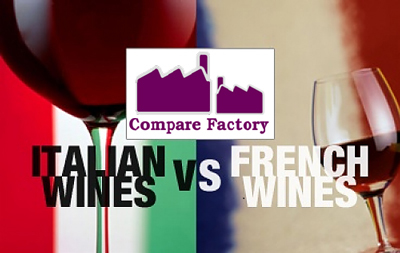 Sharing the first place in world production, Italy and France pride themselves on their wines. Generally, the best imported Italian wine you can find on the shelves in any wine store, belongs to one of the following categories: Super Tuscans: like Sassicaia, Viticcio, Antinori, and Tenuta dell’ Ornellaia; Barrolo and Barbaresco, Amarone and Pinot Grigio; all typical Italian names for wine. And when looking for French wines, you’ll encounter something like: Bordeaux, Burgundy, Rhone Valley, Alsace, The Loire. Aside from very different and very distinct names, several other things make imported Italian wine differ from French wine styles. First and most important, Italian and French wines are not made from the same grapes. France mainly uses varieties such as Cabernet Sauvignon, Merlot, Chardonnay, Genache, Syrah and Pinot Noir, while Italians use Sangiovese, Pinot Grigio, Nebbiolo and Barbera (these are just some of the Italian grape varietals since Italy has over 350 grape varietals). You can find Italian wines made from mixing Italian and French grapes. For instance, some wines from the Super Tuscans group are made of Sangiovese grape blended with Cabernet Sauvignon or Merlot, resulting in a very tasty and rather expensive imported Italian wine. Another key difference between Italian and French wines is physical geography, or where grapes are being grown. The effect of terroir on wine is huge, even if the grapes are grown across different regions of the same country. The soil and its composition matters a lot. Italy grows grapes in the far southern parts where climate is generally warmer, while the main wine regions of France are in the upper northern part of the country, where the weather tends to be cooler. Hence, the importance of climatic conditions. Last but not least, the wine-making procedures in Italy and France is very different. Generally speaking, Italians have always preferred wines that are bolder with highly accentuated tannins, but due to the high influence from USA producers, they started using oak barrels for aging, which lead them to producing softer wines. French producers on the other side, have always used barrel aging, since they always aimed for more elegant wines. It is safe to say that French wines have maintained their originality despite the sharp competition and new trends being imposed on the industry. Italians on the other hand have neglected some of their national wine marks such as the Nebbiolo, Fiano, Sangiovese and Grosso, which have shown to perform quite poorly outside Italy, compared to the French Cabernet Sauvignon or Merlot for example.